Cookies and Cream marijuana was created by Exotic Genetix. 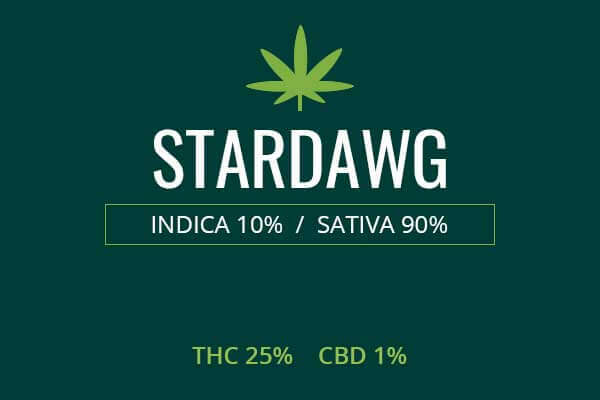 They crossed Girl Scout Cookies of a phenotype not widely known with the flavorful Starfighter strain. 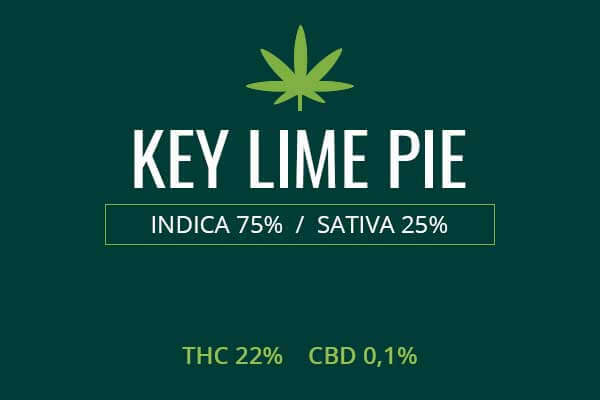 The balanced hybrid produced by this combination boasts THC levels of up to 26 % and equal stimulation and relaxation effects. 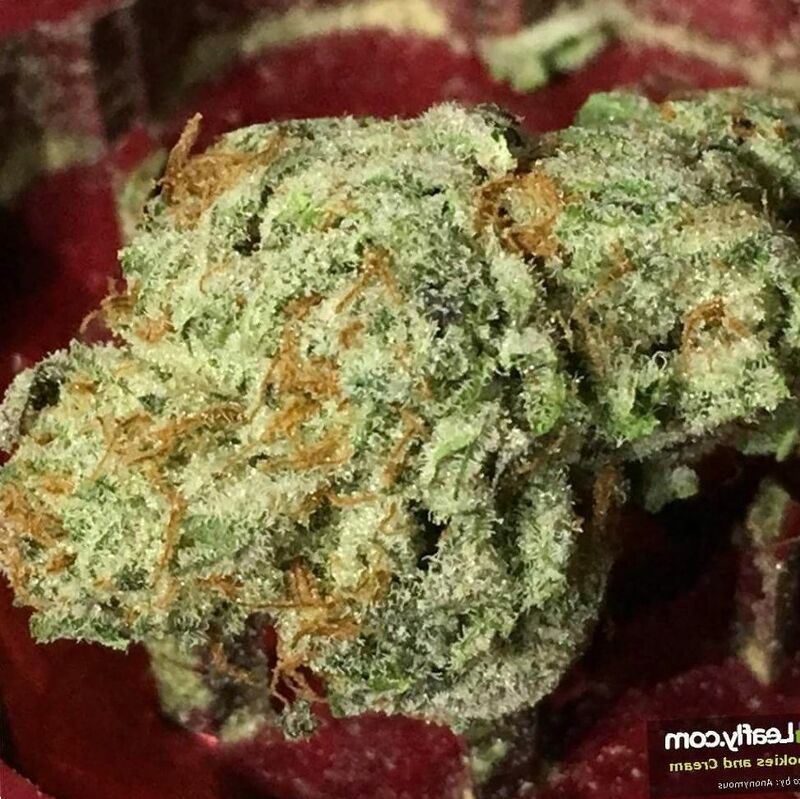 May Relieve Cookies and Cream cannabis, with its balance of relaxation and stimulation can help with moderate cases of anxiety, depression, and ADHD. It can calm an agitated brain and spark a lethargic brain. 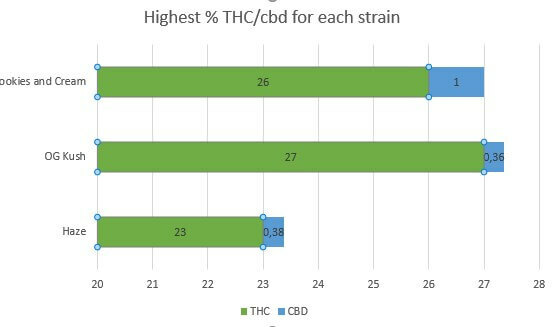 Powerful THC levels can also address chronic pain of many causes. Indoor/Outdoor Yield Cookies and cream marijuana grown in a grow house can yield about 16 ounces of weed per square meter of space. 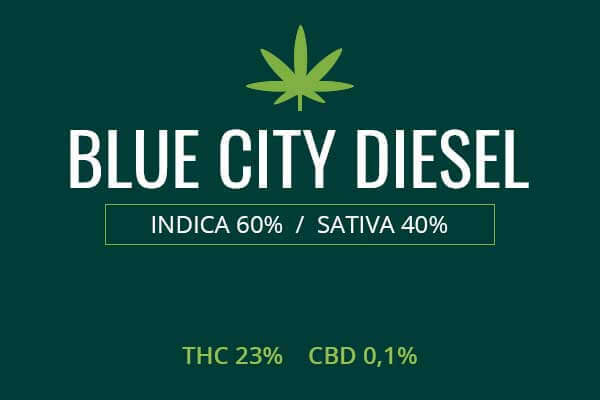 Growing in a sunny space outside, these plants can yield 16 ounces of flavorful weed per plant cultivated outdoors. Flowering time Cookies and Cream marijuana plants can flower in eight or nine weeks and be ready for a profitable harvest. Harvest Cookies and Cream will flower in the later days of the month of September or in the early days of the next month of October. 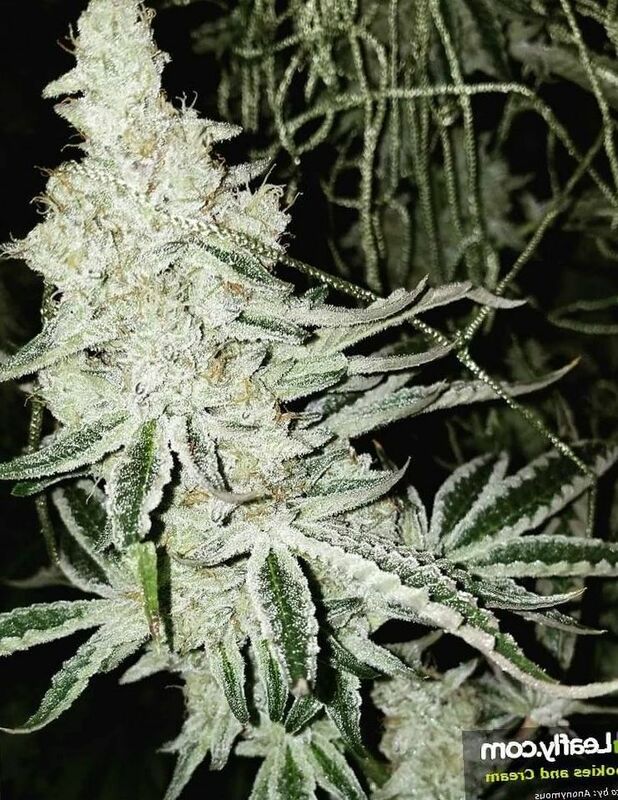 Disease resistance Cookies and Cream cannabis plants are strong like any weed but will need shelter and attention to produce a true, gourmet dessert experience. Plant Height Cookies and Cream marijuana plants are of a medium height and can reach about six feet tall. Adverse effects The Cookies and Cream cannabis is a powerful, THC packed plant and can therefore produce symptoms of panic in overdose, as well as dryness of the mucosa and red eyes. Cookies and Cream is a creation of the breeders at Exotic Genetix. They used a phenotype of Girl Scout Cookies which is not readily available and they are keeping their secrets under wraps for now. Girl Scout Cookie phenotypes are known for being powerful, blanketed in trichomes, and intensely flavorful. Starfighter is a little-known product of Alien Genetics. 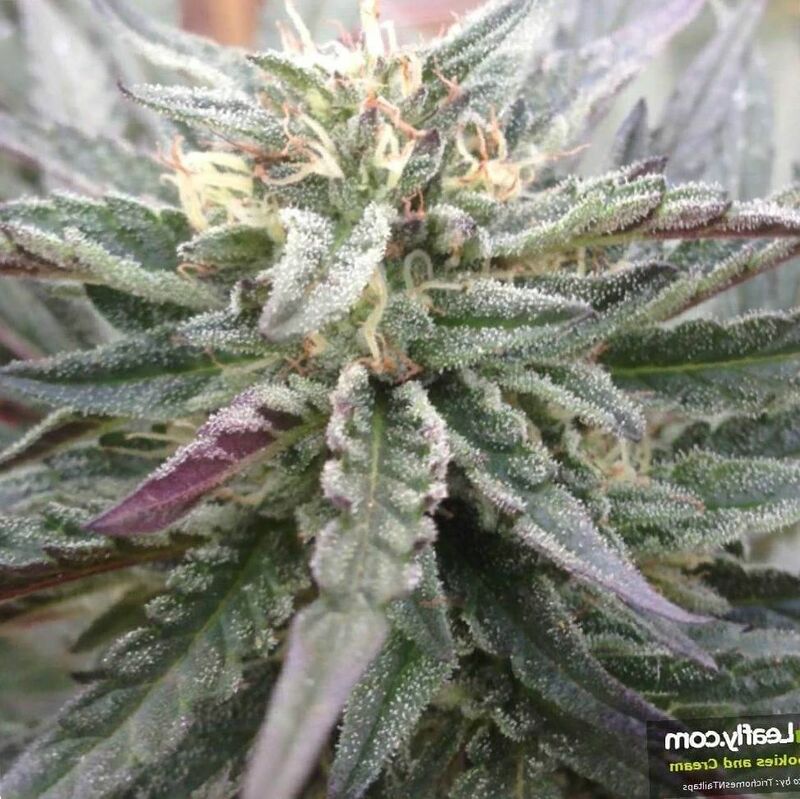 It has a powerful piney scent and is becoming a secret favorite among growers. Cookies and Cream is a plant of a medium height. The buds are of a medium size, with dark green leaves. The phenotype above is tinged with purple. These are the anthocyanins that protect the plant from cold. You can also see the blanket of trichomes on the buds and leaves. These trichomes are composed largely of THC, creating stickiness and powerful pain relief and mood boosting effects. The flavor of Cookies and Cream is its top selling point. It smells like sweet cookies and cream. There is the hint of vanilla, spice, and nuttiness, like a gourmet cappuccino. 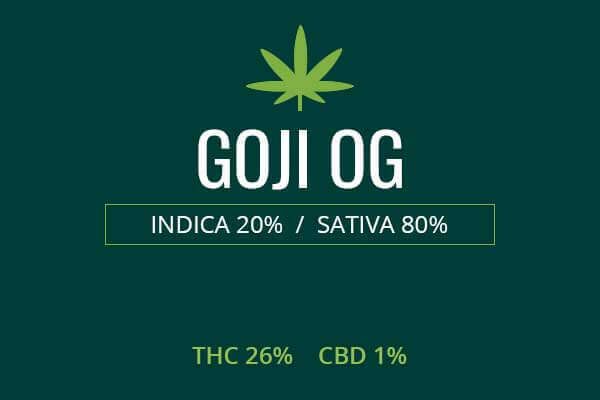 It’s rare to get a strain this flavorful with also some of the highest THC levels. We hope the breeders did it in a garden and not a lab with a CRISPR/Cas-9 kit. Genetic engineering of the marijuana plant must be just around the corner. Growing weed from Cookies and Cream cannabis seeds or cuttings is a process which is difficult due to the fact that it is an industry secret. It is inferred that this plant is going to do better grown indoors so that you can provide a carefully controlled environment. You may need a tent and high powered lamps to provide plenty of light. To increase yield, hydroponics can be used, as well as organic soils and nutrients. Growing this plant indoors, you can come away with about 16 ounces of gourmet weed per square meter of growing space. Outdoors, you want to mimic an Emerald Triangle California environment. You can do this in a spot that gets a lot of sun and has somewhat dry air. You want to grow your plant organically but it needs to be protected from environmental assaults and pests. Outdoors, you can come away with 16 ounces of weed per plant grown. 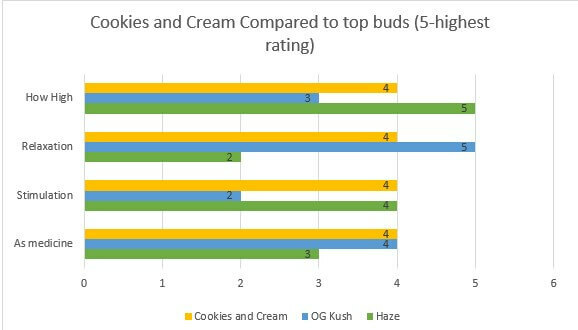 Cookies and Cream is a balanced, 50 / 50, Indica / Sativa. This makes it a great choice for improving mood disorders. Those with depression may experience the uplifting, stimulating effect. This will give them energy and the ability to see the positive side of things. It will also reduce the inflammation of the nervous system associated with depression and alter blood flow patterns in the brain which indicate depression. Users with anxiety disorder may conversely find that their anxiety is reduced and they experience a relaxation effect. This balance of stimulation and relaxation can help some individuals with symptoms of adult ADHD. It may help them get calm and provide some ability to focus. The high THC level, up to 26 %, makes Cookies and Cream a real candidate for the relieving of serious pain. This can include chronic pain conditions like shingles, fibromyalgia, and Chronic Fatigue Syndrome. It can also address pain in conditions like cancer and the symptoms that result from the treatments of radiation and chemotherapy. These treatments can cause pain, fatigue, nausea, and lack of appetite which can result in inability to gain weight. Marijuana can address each of these issues. Cookies and Cream is especially easy to imbibe in but also very powerful as a medicine. Cookies and Cream can be the perfect knockout medicine to put you in a state of couchlock from which you can slip off into an oblivious slumber. Cookies and Cream is the best weed to boost your mood on a lonely day. Invite some friends over, for smokers only (4SO). You can’t give this stuff to people who don’t smoke weed. It’s too strong and it tastes good so they will think it’s some kind of candy. This is serious medicine. For your mood, that is. Also, be ready for the munchies and be ready for couchlock and to be knocked out. You might be slipping in and out for a while, but you will certainly enjoy the whole process. The stimulating effect will make some people awake and introspective. While one friend is taking a nap, the other has become a philosopher of the self, making uncommon connections between disparate info streams. Only for those valuable jewels to slip off into forgetfulness. He will remember how you slipped off and started drooling in your euphoric cannabis dreams though, so later there will be stories of ‘remember the time you passed out’. But it’s all good. You will enjoy the experience and there are some health benefits to be had, at least over more dangerous drugs like alcohol and cigarettes. So, don’t ruin your high and your health by mixing it with other drugs or bad food.